The Lok Sabha elections 2019 have been scheduled to start from April 11 and will go on till May 19. With the first phase of Lok Sabha elections 2019 just a few days away, political parties are busy announcing candidates for the polls so they can start campaigning on the ground. While the BJP announced its sixth list of 48 candidates on Saturday, the Congress came out with its eighth list comprising 38 candidates. Prominent Congress faces in its eighth list include Mallikarjun Kharge, who has been renominated from Gulbarga in Karnataka and former Maharashtra CM Ashok Chavan who will contest from Nanded. The BJP's Saturday's lists include BJP leader Anurag Thakur from Hamirpur in Himachal Pradesh, Law Minister Ravi Shankar Prasad from Patna Sahib in Bihar and BJP spokesperson Sambit Patra from Puri in Odisha. The Lok Sabha elections 2019 have been scheduled to start from April 11 and will go on till May 19. With little time left to woo voters, parties have increased their activities, with prominent leaders holding several rallies every day. From public rallies to workers' meetings, big leaders of the national as well as state parties are leaving no stone unturned to ensure victory in the polls. BusinessToday.In brings you all the latest updates related to the General Elections 2019. 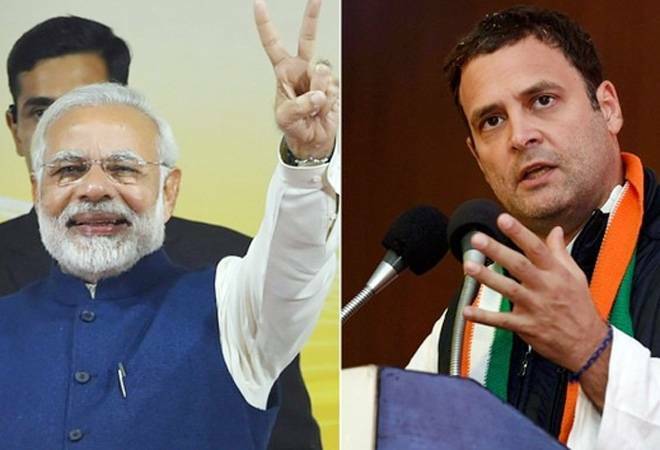 6:20pm: PM Modi has forgotten about his bonhomie with "chaiwalas", is now remembering "chowkidars", and will focus on somebody else the "next time" for political gains, PTI quoted senior Congress leader Kapil Sibal as saying. 6:10pm: Addressing a press conference in Guwahati, BJP national general secretary Ram Madhav said the Congress might win an election in Pakistan if it contests from there as the opposition party is "banking on lies" and the neighbouring country, PTI reported. 6:00pm: Congress released the 10th list of 10 candidates for the upcoming Lok Sabha elections. 5:15pm: Defence Minister Nirmala Sitharaman has said that 2019 polls is going to make a big difference for India. 4:50pm:Jharkhand polls: Congress, JMM reach Lok Sabha seat agreement. 4:40pm: According to UP Congress Secretary, Narendra Rathi, Sapna Chaudhary had filled the membership form herself, her signature is on it. Her sister also joined the party yesterday, we have both of their forms. 3.38pm: Haryanavi singer & dancer Sapna Chaudhary: "I have not joined the Congress party. The photograph with Priyanka Gandhi Vadra is old. I am not going to campaign for any political party." 3.37pm: Shailesh Kumar to contest on the RJD ticket from Bhagalpur, and Jayprakash Narayan Yadav from Banka constituency. 3.34pm: The Congress party has been fielded Mahesh Pathak, a local businessman, from Mathura. 3.33pm: Country going through big employment crisis, will be key issue in Cong campaign, says Sam Pitroda. Employment, employment, and employment -- will be the focus of the Congress's election campaign, party's manifesto committee member Sam Pitroda has said, asserting that the country was going through a jobs "crisis", reported PTI. Pitroda, a long-time Gandhi family adviser and the chief of the Indian Overseas Congress, said agrarian distress is also a major issue facing the country and it needs to be addressed. In an interview to PTI, he said Priyanka Gandhi Vadra will make a huge impact in the general elections. 3.27pm: UP CM Yogi Adityanath in Saharanpur. "Main naamdaro ke kuldeepak ki ek baat ko sun raha tha, vo keh rahe the ki ganna ke pedh nahi lagaye. Unhone kaha ki humari sarkar ayegi to dedh feet ka aalu ugwa degi. Jaise aam ka phal aata hai, unhe lagta hai aalu ka bhi aata hoga." 3.10pm: "Dynastic parties have one major drawback. If the current generation dynast is lacking in charisma, understanding & popular confidence, the crowd around the family gets frustrated. The same is happening with Congress Party which is paying the price for its dynastic character," says Arun Jaitley. 3.08pm: Finance Minister Arun Jaitley accuses the Congress party of benefitting from the dynasties politics. "The Congress Party has been out of power for 5 years. Its leaders & workers are accustomed to existing with the frills of office. They are staring at another defeat, and the seeming reason for this is the Dynastic Character of Congress Party," says the Finance Minister. Owing to low-ability & greatness thrust on them, dynastic leaders lack self-awareness. Psychologists refer this as the Dunning-Kruger effect. This seems to be the reason which persuades the Congress President to cross the line of decency and dignity when he refers to the PM. 2.30pm:BJP MLA Surendra Singh on dancer SapnaChaudhary joining Congress: "Rahul ji ki Mata ji bhi Italy mein isi peshe sethi. Jaise aapke pitaji ne Sonia ji ko apna bana liya tha, aap bhi Sapna koapna banaye." Dynasties demolish organisational structures & the party becomes a crowd around the dynast. The Congress was original creator of this concept. Ch. Charan Singh aptly said that world over parties elect leaders; in India, leaders create parties, which travel with the leader. 1.15pm: BJP spokesperson and the party's Lok Sabha candidate from Puri in Odisha, Sambit Patra has accused Congress President Rahul Gandhi of earning crores of rupees through illegal land earnings. "Rahul-Priyanka earned Rs 3 crore by renting the Indira farm house, which is worth over Rs 5 crore. They rented it to businessman Anil Ambani and received an initial payment of Rs 40 lakh by putting this farm house on rent," says Sambit Patra. He added the Gandhi family had no earnings but owned a farm house. 12.00pm: Kanhaiya Kumar will contest polls from Begusarai on CPI ticket. 11.45am: After taking their protests to the National capital to highlight their demands, Tamil Nadu farmers are gearing up for an electoral battle and will file 111 nominations from the Varanasi Lok Sabha constituency from where Prime Minister Narendra Modi is contesting, reported PTI. Tamil Nadu farmers leader P Ayyakannu has said that 111 farmers from the State will contest against Modi from Varanasi. Ayyakannu, who is also president of the National South Indian Rivers Inter-Linking Farmers Association, said the decision to contest the polls from Uttar Pradesh was to urge the BJP to include in their manifesto that their demands, including "profitable prices for farm produce," would be fulfilled. 11.35am: Arun Jaitley on the NDA government's achievements in the last five years. 11.34am: Finance Minister Arun Jaitley on 'Yeddy Diary': "Voters are wiser than politicians and the perpetrators of falsehood in the small section of media." 11.15am: Congress' Manipur unit has accused the BJP of putting up an insurgent-backed candidate for a Lok Sabha seat here and compromising national integrity in a bid to win the upcoming elections at any cost, a charge rejected by the latter as an attempt to malign the party, reported PTI. BJP's candidate H Shukhopao Mate for the Outer Manipur parliamentary constituency, which goes to polls on April 11, has been accused of being backed by insurgent groups in the state -- Zomi Re-unification Organisation (ZRO) and Kuki National Organisation (KNO). 11.00am:The BJP days a total of 76.48 lakh jobs werecreated since September 2017 till January 2019 as per the EPFO payroll data. InJanuary 2019, jobs created were at 17-month high at 8.96 lakh. 10.47am: Samajwadi Party releases its list of star campaigners; Akhilesh Yadav, Ram Gopal Yadav, Azam Khan, Dimple Yadav and Jaya Bachchan included in the list; Mulayam Singh Yadav's name not there. 10.35am: Akhilesh Yadav has decided to contest elections from Azamgarh. 10.15am: Shatrughan Sinha after the BJP denied him Lok Sabha ticket: "People are watching at this hour". Nonetheless, people are watching at this hour, to give a befitting reply for all this that is being done by the one man show & 2 men army company. Long Live Shri. Advaniji! Jai Hind! 9.57am: PM Modi shares his website link that features the NDA government's work in various sectors over the last five years. 9.49am: The RSS/ BJP channelises bigotry & hatred for political power, alleges Rahul Gandhi. Sharing an interesting section on my website that gives you a comprehensive glimpse of the NDA governmentâ€™s work in various sectors over the last 5 years. 9.49am:Rahul Gandhi shares pictures of a huge gathering in his political rally in West Bengal. 9.43am: Odisha CM Naveen Patnaik says the returning of MLA Duryodhan Majhi will strengthen the Biju Janata Dal (BJD). 9.00am: Famous Haryanvi dancer, singer and Big Boss participant Sapna Chaudhary on Saturday joined the Congress party. Reports suggest the Congress may field her against actor Hema Malini from Mathura. 8.40am: Former BJP CM from Uttarakhand BC Khanduri's son Manish khanduri has been fielded from Garhwal Lok Sabha seat. Manish recently joined the Congress party. 8.30am: The Congress has fielded Digvijaya Singh from Bhopal and former Uttarakhand CM Harish Rawat from Nainital. 8.00am (March 24): The Congress Saturday releases its eighth list of 38 candidates; Leader of Opposition in the current Lok Sabha, Mallikarjun Kharge, has been renominated from Gulbarga in Karnataka and former Maharashtra chief minister Ashok Chavan has been fielded from Nanded. 8:30pm (March 23): BJP releases another list of candidates for the upcoming Lok Sabha elections. 7:00pm: BJP national spokesperson Sambit Patra thanked Prime Minister Modi and party President Amit Shah for his candidature from Odisha's Puri. 6:50pm: Former J&K CM and PDP leader Mehbooba Mufti on Saturday said she will be contesting from Anantnag parliamentary constituency. 6:35pm: Karnataka CM HD Kumaraswamy pays last respects to state Minister C S Shivalli who died on Friday. 6:25pm: Union law minister Ravi Shankar Prasad raises question over rise in Congress president Rahul Gandhi's income between 2004 and 2014. 6:15pm: Rebel BJP leader Shatrughan Sinha has alleged that senior leader L K Advani was deliberately sidelined by the party. He has not been allotted any Lok Sabha seat by the BJP. some people, even shameful... that which your people have done was the most expected & awaited....orchestrating the departure of a most respected friend, philosopher, guide, father figure & ultimate leader of the party Shri. L.K.Advani, from the political arena/ election. 6:10pm: Former IAS officer Shah Faesal on Satirday said his political party, Jammu and Kashmir People's Movement, will not contest elections this time around. 6:00pm: Major Surendra Poonia, an international award-winning sportsman, on Saturday joined BJP in the presence of senior BJP leaders JP Nadda and Ramlal. 5:50pm: A Supreme Court lawyer on Saturday filed a complaint against Delhi CM Arvind Kejriwal over a tweet posted by him recently. 5:40pm: Maharashtra polls: Congress to contest on 24 seats, NCP on 20 seats, Bahujan Vikas Aghadi on 1 seat, Swabhimani Shetkari Sanghatana on 2 seats, Yuva Swabhimani Paksha on 1 seat. 5:15pm: Karnataka: H.D. Devegowda, the former Prime Minister of India, will contest from the Tumkur parliamentary constituency as the combined candidate of JDS & Congress. 5:10pm: Maharashtra: There was 26-22 formula between Congress-NCP, ANI quoted sources as saying. Now they've given 2 seats from each one's quota to allies. 5:05pm: Oommen Chandy, the former Chief Minister of Kerala, has reportedly said that we have requested Rahul Gandhi to contest from South India. I have discussed it with the proposed candidate for Wayanad constituency and he welcomed it, Chandy said. 5:00pm: Delhi Police cancels permission for Chief Minister Arvind Kejriwal's jansabha in Shakur Basti. 4:45pm: Congress President Rahul Gandhi on Saturday slammed West Bengal Chief Minister Mamata Banerjee in his rally in Malda. 2.24pm: Congress leader Digvijay Singh to contest elections from Bhopal, Madhya Pradesh. 2.01pm: Congress leader Oommen Chandy says Karnataka Pradesh Congress Committee has requested Rahul Gandhi to contest from Kerala. "Main aapko sachhai bata raha hun. Bihar ke yuvaon jaag jao, har roz aap ke jeb se paisa loota ja raha hai," says Rahul Gandhi in Bihar. 1.59pm: "Vo (PM Modi) hain chowkidaar, magar gareebo ke nahi, Anil Ambani ke chowkidaar hain," says Rahul Gandhi, during a political rally in Purnea, Bihar. 1.56pm: BJP ke sare Chowkidar Chor Hai, says Rahul Gandhi. 1.36pm: Lok Janshakti Party state president Pashupati Kumar Paras will be replacing his elder brother Ram Vilas Paswan in Hajipur. The Union minister is likely to get a Rajya Sabha ticket. Amit Shah accuses Rahul Gandhi of "standing in support when slogans are raised against the country in JNU", and calling it the freedom of expression. 1.32pm: "If a country shouldn't be held responsible for deeds of 7-8 people, does the Congress believe that the Pakistan govt and military has a connection with terror attacks here?" asks Amit Shah. 1.30pm: BJP Chief Amit Shah on Indian Overseas Congress Chief Sam Pitroda's remark on Balakot airstrike: "The Congress President should explain it to the nation -- do you consider such heinous attack (Pulwama attack) a routine incident?" 1.28pm: BJP MP Pratyusha Rajeswari Singh joins BJP in presence of Union Minister Dharmendra Pradhan. 1.00pm: Ravi Shankar Prasad on being given BJP's Lok Sabha ticket from Patna Sahib: "Patna is my city, I was born there, studied there, became a lawyer." 12.30pm: BY Raghavendra (son of BS Yeddyurappa) on 'Yeddy Diary' row: "It's joke of the year." 12.15pm:The Shiv Sena has said LK Advani wouldremain the "tallest leader" of the BJP irrespective of his pollpresence, two days after the party nominated its chief Amit Shah fromGandhinagar, a seat represented by the BJP patriarch, reported PTI. In aneditorial in the party mouthpiece "Saamana", the Sena said Shahcontesting in place of Advani is politically translated as the 'Bhishmacharya'of Indian politics being "forced" to retire. "Lal Krishna Advaniis known as the 'Bhishmacharya' of Indian politics, but his name does notfeature in the list of BJP's candidates for Lok Sabha polls, which is notsurprising," the edit said. The Sena said the development underlined thatthe BJP's Advani era has come to an end. "Advani has been elected fromGujarat's Gandhinagar constituency six times. Now, Amit Shah will be contestingfrom that seat. This simply means Advani has been forced to retire," theeditorial said. Marking a generational shift in the BJP, the party recentlyannounced candidature of Shah, who will be contesting his debut parliamentaryelection, from Gandhinagar. 11.45am: Lok Janshakti Party's Chirag Paswan to contest from Jamui. Ramkirpal Yadav to contest from Patliputra, RK Singh from Arrah, Aswani Choubey from Buxar, Radha Mohan Singh from East Champaran, Rajiv Pratap Rudy from Saran, reports ANI. Shatrughan Sinha has been denied ticket by the party. 11.30am: Ravi Shankar Prasad will be the BJP's candidate from Patna Sahib. Nawada MP, Giriraj Singh, will contest from Begusarai, reports ANI. 11.10am: Prominent among those who are denied re-nomination is Dindori MP Harishchandra Chavan, who has been representing the tribal-dominated seat since 2009, reported PTI. This time, the party has reposed faith inNCP turncoat Bharti Pawar, who had lost to Chavan in 2014 polls by a hugemargin. The BJP has given ticket to KanchanKul, wife of Daundlegislator RahulKul,from Baramati seat in Pune district against Sule, daughter of Sharad Pawar.Rahul Kul is the MLA of Rashtriya Samaj Paksh, an alliance partner of the BJPin Maharashtra. 10.45am: The BJP has replaced four sitting MPs in Maharashtra in its third list of six candidates from the state, and has fielded a woman candidate from Baramati, the bastion of NCP chief Sharad Pawar, against sitting MP Supriya Sule, reports PTI. With six candidates from Maharashtra, the BJP has so far announced names of 22 candidates. The saffron party is contesting 25 out of total 48 seats in alliance with the Shiv Sena, which will fight on rest of the seats. The BJP had won 22 of the 24 Lok Sabha seats that it contested from Maharashtra in 2014. 10.18am: Karnataka Chief Minister HD Kumaraswamy Friday said his son Nikhil Kumaraswamy and nephew Prajwal Revanna were not contesting the Lok Sabha polls for "fashion", but for the sake for the people, reported PTI. Conceding that that there were "small" issues between alliance partners Congress and JD(S) which would be resolved, he said both parties will follow "coalition dharma". "...on the basis of our (Kumaraswamy and Revanna) work, from our family again two young powers are in the fray,they are not contesting for fashion," Kumaraswamy said. 10.11am: The Assam unit of National People's Party (NPP) releases its first list of candidates. 10.02am: Congress leader Jitin Prasada on reports that he is in touch with the BJP. 9.49am: The Congress party on Friday accused BJP leader BS Yeddyurappa of paying over Rs 1,800 crore to the BJP's national leaders during the BJP's government in the state. The party alleged that Yeddyurappa's signatures were found on every page of the diary. Citing a report by the Caravan Magazine, Congress spokesperson Surjewala said the BJP leader had recorded these alleged payouts, written in Kannada, in a diary of a Karnataka MLA in 2009. Yeddyurappa has denied the charge, saying the report was planted by the Congress to malign his party's image.Read the full story here. 9.35am: In its bid to limit election spending, the Election Commission of India (ECI) has imposed strict limits on the expenditure incurred by candidates on their election campaign. Read the full story here. 9.20am: Congress President Rahul Gandhi will hold a rally in Purnia district of Bihar on Saturday as part of his election campaigning for the 2019 Lok Sabha elections. He will also hold another political rally in West Benga's Malda district. 9.15am: The BJP may also release its fourth list of candidates today. 9.00am: Girish Bapat to contest from Pune (Maharashtra), Sambit Patra to contest from Puri (Odisha). 8.00am: Alist of the candidates given the BJP ticket for the Lok Sabha elections 2019 so far. 7.00am: The Congress released its third list of 35 candidates on Friday. The party has nominated Imran Pratapgarhiya from Moradabad where Babbar's candidature was announced earlier. The party fielded former Union Minister Renuka Chowdhury from Khammam in Telangana. The party also fielded Vikramaditya Singh, the son of former Union Minister Karan Singh, from Udhampur constituency in Jammu and Kashmir.